Rooms, services Take a few-days trip to Czech Republic and enjoy the hospitality of Hotel Meritum Prague. 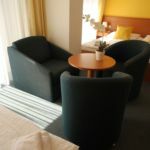 The hotel is offering 50 comfortable rooms to guests looking for accommodation in Prague. You are also welcome at the hotel for a fine local meal in the restaurant. For meetings and nice evening chats the local bar will provide an ideal location. We recommend the option to rent a conference room especially to business travellers. You may secure your valuables in the safe. If you have a suitable portable device, you can connect to the Internet for free via a wireless network (WiFi) available in the rooms. The exact scope of services offered by Hotel Meritum Prague (including those for an extra fee) is available on the information sheet below. RevNGo.com rating The hotel has received 9 score and thereby "Very good" classification on RevNGo.com, based on one review. 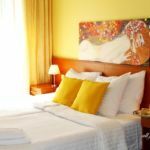 The rating of Hotel Meritum Prague is 9 from the maximum 10, 1 based on actual and valid guest ratings and reviews.